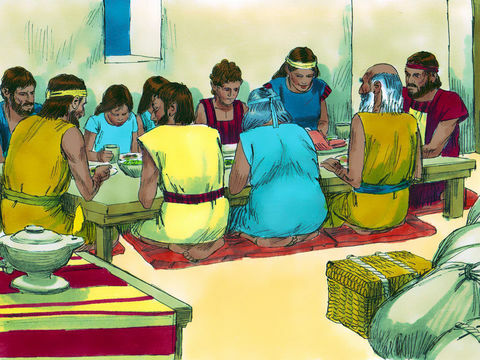 Read Together: The Lord told Israel to be prepared to leave when they ate the Passover. He knew that Pharaoh would tell the Israelites to get out of Egypt after the death of their firstborn children. The Egyptians also wanted the Israelites to go away. Before leaving, the Israelites asked the Egyptians for gold, clothing, and things of value, and the Egyptians gave it to them. To prepare for the journey, the people were organized according to their families and tribes, and their armies. Other non-Israelites who had believed Moses and escaped the tenth plague joined with Israel to leave and serve the true God. God also at this time established the Days of Unleavened Bread to commemorate His deliverance of the children of Israel from Egypt. For seven days, Israel was commanded to eat unleavened bread and not have any leavened food in their homes. The night they left Egypt was to be remembered forever as a night of solemn observance. They had to leave so quickly that they did not have time to let their bread rise, so they only had unleavened bread to eat which was in keeping with God’s command. God’s people continue to keep the Feast of Unleavened Bread and the Night to Be Observed as ordained by God. Israel left Egypt with their flocks and their herds, with their silver, gold, and clothing; they left with a high hand. However, God had one more judgment to pass on Egypt. Pharaoh’s heart was hardened and he sent his army to capture Israel and bring them back. With the army coming, mountains on both sides, and the Red Sea at their backs, Israel thought they were trapped, but God opened a path on dry land through the sea for Israel to escape. When Pharaoh’s army attempted to follow the Israelites through the Red Sea, God caused the waters to come over them, and they drowned. God’s judgment was complete just as He had promised Abraham long ago. Ask your child how it would feel to walk on dry ground with walls of water as tall as skyscrapers on either side. Help your child to understand that it was God who delivered Israel. Help your child think about the miracles God worked to free Israel. God destroyed their economy, devastated their military, and reduced their status as a nation. Egypt has never recovered to the status they had before God’s judgment on them. Ask your child what he knows about keeping the Days of Unleavened Bread. Read Together: After God sent the first nine plagues on the Egyptians, the crops had been destroyed, most of the livestock was dead, and Egypt was suffering. But Pharaoh would still not let the Israelites go free. God decided to bring one more plague on Egypt. This plague would be so great that Pharaoh would demand that Israel leave Egypt. God was going to put to death the firstborn of man and beast in all of the land of Egypt. However, God planned a way to save the Israelites. God told Moses to have each Israelite family select a perfect lamb from their herd. Four days later, just after sunset, they were commanded to kill the lamb, placing its blood on the doorposts of their home. Then, they were commanded to roast and eat it. Every home that had blood on the doorway of their home was protected from the last plague. The Egyptian homes, with no blood on their doorways, would suffer the death of their firstborn as the death angel passed over their house. This was a dramatic and terrifying night. Throughout Egypt, many people died. But the Israelites were kept safe by the protection of God, and the blood of the lamb. And they were released from their Egyptian taskmasters, as the Pharaoh commanded the Israelites to leave Egypt. God commanded Israel to remember what had happened in Egypt, how He had protected the children of Israel, and to keep it as a memorial forever. That is why the name of this memorial is Passover. The Passover lamb pictured the sacrifice that Jesus Christ would make by shedding His blood for the salvation of all mankind. The Church of God still observes the Passover every year as God commanded, but with bread and wine instead of a Passover Lamb. Help your child to understand that every household in Egypt was affected by the tenth plague. Help them identify all the people in their family who are firstborn. Ask what would happen if an Israelite family did not obey Moses’ instructions. Ask your child to explain why this memorial is called Passover. Discuss what it might be like to have a lamb living in in your house for four days. Explain that the sacrifice of the lamb was symbolic of Jesus Christ’s future sacrifice. Explain to your child that the Church of God still keeps the Passover, but with different symbols which Christ taught. Help them understand what the new symbols(wine and bread) represent. But Pharaoh would come to regret his disrespect and disregard of the true God. God sent one plague after another upon Egypt–each one attacking one of their gods. In the first plague, their sacred river was turned to blood. But Pharaoh would not let the people go. In the second plague, frogs appeared everywhere. Still, Pharaoh stubbornly refused to let the people go. Nine times, in plague after plague, Pharaoh started to soften, then hardened his heart toward Israel and the true God. Finally, after the 10th and last plague, Pharaoh let Israel go. Help your child to understand that God gave Moses specific instructions on what to do. 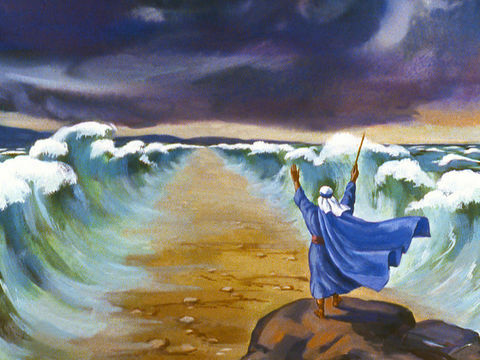 Moses was not deciding what to do on his own. Ask your child how the Israelites might have felt when they were not delivered after Moses’ first meeting with Pharaoh.Instead of being set free they were made to work harder. 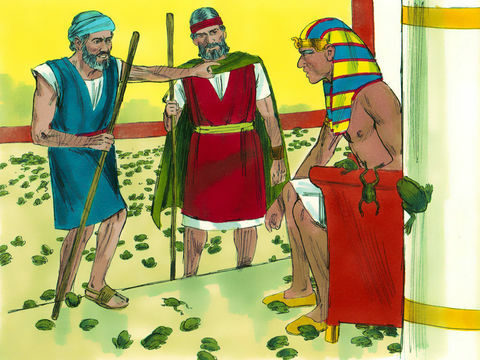 Help your child identify each of the plagues as you read about them and discuss what each might have been like for the Egyptians. Explain that God brought these things about to show Egyptians and Israelites that He is God and there is no other. 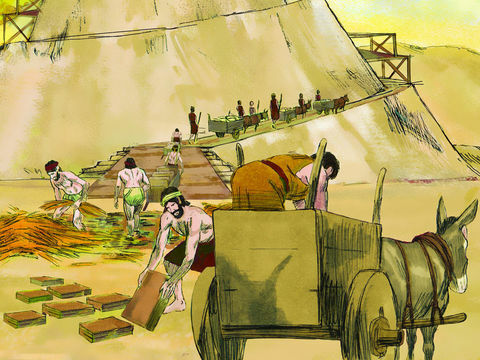 Read Together: Babel, the first city that Nimrod built, was the beginning of his kingdom. The people all spoke the same language, so it was easy for them to share ideas and work together. But instead of working together for good, they began to rebel against God. Even though God had commanded them to fill the earth with their families, the people refused. 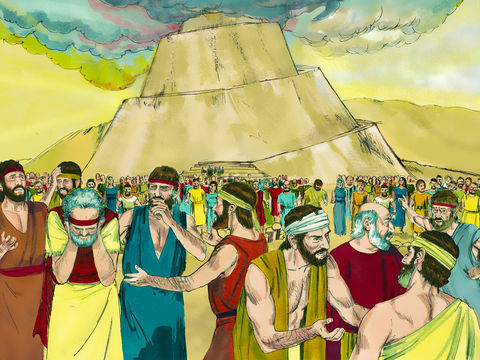 With Nimrod as the leader, the people built a huge tower in the city of Babel. The city they built, with its towering fortress, made the people very proud of themselves and what they had done. They were so proud that they believed they could defy God. But the people did not know the amazing miracle that would happen next. The people knew what they were doing was wrong. Noah was a preacher of righteousness (2 Peter 2:5), and he would have continued to preach after the flood. Explain to your son or daughter that the people were being disobedient and wanted to do things their own way, regardless of what God said. Help your child to understand that there is never a time when we can rebel against God. Still, when we do something wrong, we can ask God to forgive us, and He will. God loves us, and we can rely on Him to provide for us and protect us. https://www.lcgeducation.org/wp-content/uploads/2019/03/002-tower-babel.jpg 360 480 Rebekah Ross https://www.lcgeducation.org/wp-content/uploads/2018/07/LE_logo-2.png Rebekah Ross2019-03-15 10:27:402019-03-15 10:33:42Children's Bible Program - Level 1: Lesson 19 "The Tower of Babel"
Read Together: After the flood, people began to raise families, and gradually moved further and further away from where the ark had come to rest. 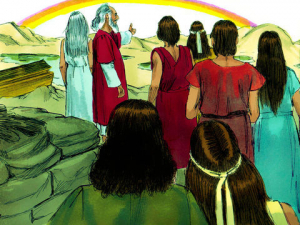 The Bible tells us about the families of Shem, Ham, and Japheth, and how they began to populate the earth. We read about one man who became famous as a great hunter. This man’s name was Nimrod, and he was the grandson of Ham, one of Noah’s three sons. As his fame grew, he was idolized by many. In fact, some people began to look to Nimrod instead of God for protection and leadership. They called him “the mighty hunter before [“instead of” or “in place of”] the Lord” (Genesis 10:9). Remember, God had commanded the sons of Noah to fill the earth (Genesis 9:1). 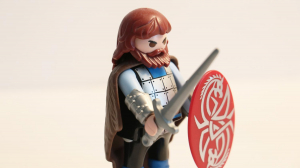 But proud Nimrod rebelled against God, building cities and a kingdom. One of the cities he built was the famous Babel, where the people began to build a giant tower, reaching into the sky. Help your child to understand that the people were looking to Nimrod as their provider and protector and not looking to God. Remind your child that God is our ultimate provider and protector. Nimrod was setting up a kingdom for himself to make himself the ruler over the people. You may want to take this opportunity to explain that in God’s government, men do not choose to be in charge themselves. God selects the leaders. Help your child to understand that Nimrod was leading the people away from God. 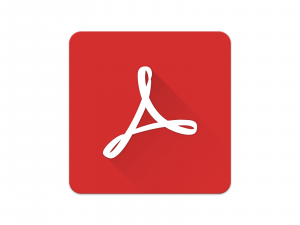 https://www.lcgeducation.org/wp-content/uploads/2019/02/rock-n-roll-monkey-1276453-unsplash.jpg 842 1500 Rebekah Ross https://www.lcgeducation.org/wp-content/uploads/2018/07/LE_logo-2.png Rebekah Ross2019-03-07 17:55:272019-03-08 13:30:17Children's Bible Program - Level 1: Lesson 18 "Nimrod"
Read Together: God destroyed every human being on the face of the earth with the exception of 8 people – Noah and his sons, Shem, Ham, Japheth, and their wives. A pair of every unclean animal and seven pairs of all clean animals survived with Noah and his family on the ark. After the flood, God commanded Noah, his sons, and the animals to multiply on the earth, and that is exactly what they did. People lived longer so they were able to have many children. Soon families grew so big that they formed nations, and the nations were all separated into their own lands. Help your child to identify the eight people that survived the flood. Discuss with your child why God told Noah to take seven of every clean animal on the ark. Help your child visualize what the earth might have been like after a few years with so few people and so many animals which were multiplying very quickly. Explain to your student that though their numbers were increasing, the people were still united by language and culture. 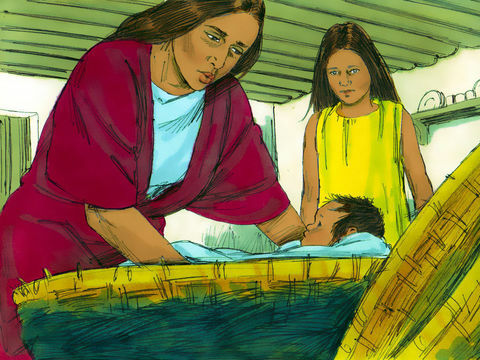 Help your child recognize that after the flood there were only eight people, and today, about 5 thousand years later, there are almost eight billion people all of whom are descended from Noah. https://www.lcgeducation.org/wp-content/uploads/2019/02/024-noah-ark.jpg 360 480 Rebekah Ross https://www.lcgeducation.org/wp-content/uploads/2018/07/LE_logo-2.png Rebekah Ross2019-02-28 16:51:092019-02-28 17:21:05Children's Bible Program - Level 1: Lesson 17 "Families Grew into Nations"
Read Together: After the Flood was over, the ark came to rest on top of the mountains of Ararat. These mountains are in the country called Turkey today. Noah, his family, and the animals remained aboard the ark for more than a year. Wow! It took a long time before the earth was dry enough for them to live on it. After they left the ark, God told Noah, Shem, Ham, and Japheth that He wanted them to have big families and fill the earth with more people. God also made a new covenant with all living creatures that He would never again destroy the earth with a flood. 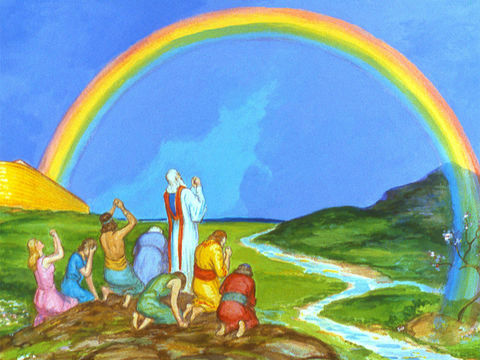 The sign God gave of this new covenant was the rainbow. Read Together: Genesis 8:1–22; 9:1, 11–19. Ask your child, by way of review, what was the Flood? Why did God bring the Flood on humanity? Ask your child, what was the promise God made after the Flood was over? What was the sign of that promise? Ask your child if he or she has ever seen a rainbow. What does it look like? How would he or she describe it? Discuss God’s command to Noah and his sons to “be fruitful and multiply.” Why did God ask them to have lots of children? Were there any people other than Noah and his family alive after the Flood? Explain that every living human being today is descended from Noah and his sons. 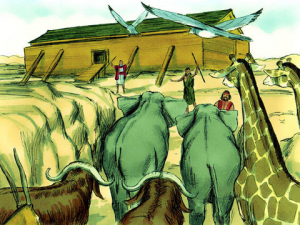 Your child might be interested in comparing the size of the ark with modern structures. This website had some interesting comparisons. There are several Noah’s ark crafts available on Pinterest that your child might enjoy. There are several videos on YouTube of the Noah’s ark replica in Kentucky. This Noah’s Ark Encounter video is short but it does mention the dimensions. https://www.lcgeducation.org/wp-content/uploads/2019/02/047-moody-noah-flood.jpg 360 480 Rebekah Ross https://www.lcgeducation.org/wp-content/uploads/2018/07/LE_logo-2.png Rebekah Ross2019-02-21 19:33:372019-02-25 16:57:33Children’s Bible Program – Level 1: Lesson 16 “The Rainbow Covenant"
Read Together: Following God’s instructions, Noah immediately began to build an ark to save his family and the land animals from destruction. Noah and his sons, Shem, Ham, and Japheth, may have worked on building the ark for many years. While the people surely made fun of him for building a boat on dry land, Noah warned them to repent and obey God so that they too could escape the coming Flood. No one but his family listened to Noah. In the end, there were only eight people that entered the ark: Noah, Shem, Ham, Japheth, and their wives. God sent seven pairs of every clean animal to the ark, males and females, so He could preserve their lives. He also sent two of every unclean animal, a male and a female, as well as seven pairs of birds, males and females, for Noah to keep in the ark. After Noah, his family, and all the animals were inside, God sealed the door to the ark. After seven days, it began to rain. The waters from under the earth gushed up and the rain from heaven poured down, for forty days and forty nights! The water was so high that it covered the mountains! Only those on the ark survived. Ask your child why God destroyed all land animals, birds, and human beings. Ask why God spared Noah and his family. Ask your child how many people were aboard the ark and who they were. Explain to your child that during the time that he was building the ark, Noah was warning the people about the coming Flood. God was giving them an opportunity to repent and be saved. Emphasize God’s mercy in wanting the people to be saved. Explain to your child what makes animals “clean” or “unclean.” Why did God tell Noah to take more clean animals on the ark than unclean? You may want to use this as an opportunity to talk about God’s dietary laws in Leviticus. https://www.lcgeducation.org/wp-content/uploads/2019/02/009-noah-ark.jpg 360 480 Rebekah Ross https://www.lcgeducation.org/wp-content/uploads/2018/07/LE_logo-2.png Rebekah Ross2019-02-15 13:25:082019-02-15 13:25:08Children's Bible Program - Level 1: Lesson 15 "Noah, the Ark, and the Flood"